CWPPRA projects are constructed within 5-7 years from initiating engineering and design. CWPPRA projects are built in a series of phases. The first in the series of phases is Phase Zero which includes conceptual project development. Once a project is approved through the CWPPRA selection process, the project undergoes two subsequent phases to completion. Following the initial phase is Phase One where a combination of pre-construction data collection and engineering and design is incorporated. Lastly, Phase Two encompasses construction, project management, construction supervision and inspection, and operations, maintenance, and monitoring or OM&M. CWPPRA serves as the foundation for the development of restoration science and identification of project needs that have become the platform for other restoration funding programs. 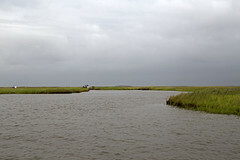 Over 25 years, the Coastal Wetlands Planning, Protection, and Restoration Act has authorized 210 projects, benefiting approximately 100,000 acres.